China will help the African Union establish a representational office in its capital, Beijing, said a communique issued by the AU following a two-day official visit to the country by Chairperson of the AU Commission Moussa Faki Mahamat. 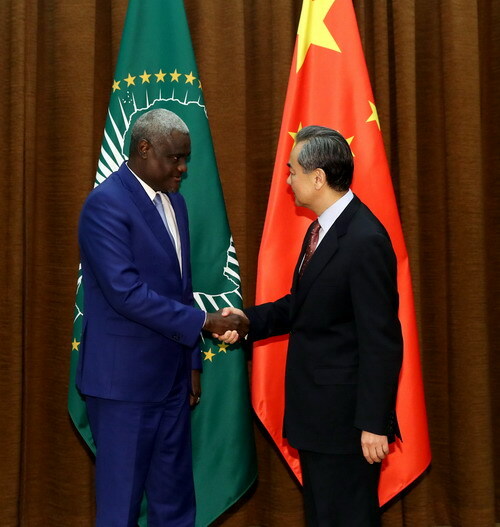 According to Mahamat, China has welcomed the planned establishment of an African Union Office in Beijing to ensure effective and timely follow-up of the China-Africa partnership. The representation will also support the work of the African Group of Ambassadors in Beijing, to ensure alignment with African Union positions. The communiqué said China had agreed to continue supporting institutional capacity at the African Union. This is in addition to their ongoing support for African Union infrastructure, including the New Conference Centre and the renovation of other buildings in the AU compound. China will focus on strengthening practical cooperation with the AU in the fields of the AU’s capacity construction, transnational and trans-regional infrastructure construction, peace and security, public health, tourism and aviation, and help Africa achieve peace, stability and sustainable development, the communiqué added. Leaders of China and the African Union have recently denied a report by the French daily newspaper Le Monde that Beijing spied for years on the African Union’s Chinese-built headquarters in the Ethiopian capital, Addis Ababa through computer systems it helped install. Posted by Geraldine Boechat on February 12, 2018. Filed under News. You can follow any responses to this entry through the RSS 2.0. You can skip to the end and leave a response. Pinging is currently not allowed.